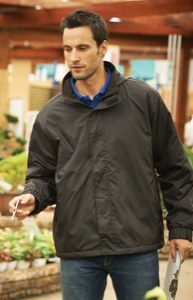 Description Regatta w aterproof jacket with c oncealed hood. Stormflap with hook and loop. Reflective trim to front and back. Elasticated cuffs. 2 zipped lower pockets. Concealed zip entrance in lining for embroidery access Suitable for print and embroidery. Available in sizes small to xxlarge. Colours: Navy, Red and Black. Unit prices including embroidery in one position up to 5,000 stitches. 25 units €32.00 / 50 units € 31.00. Prices are per unit and exclude vat and embroidery set-up charges.